Looking for a fun compact drone? Announced at InterDrone 2017, updated at CES 2018 and finally hitting the streets in April of 2018, this is a drone worth your consideration. The GDU O2 is a compact machine with a focus on portability, it flies fast, it shoots 4K video and it sells at a fair price. We may be able to sum it up in one sentence, but it’ll take a few more words than to to fully explore. Sit back, relax, it’s time to learn about the GDU O2. When we say that the GDU O2 focuses on portability, we have to admit that it packs down into one of the safest and easiest drones to transport that we’ve ever laid hands on. The folding design of many similar machines usually leaves the propellers exposed, and the remote control is sometimes even an after thought. The GDU O2 has sliding propeller arms. The power of this design is that the propellers can more easily be protected. The design here has the arms at about mid-body, with side slots that the propellers fold into. The gimbal is secured by a big plastic cover and then the entire GDU O2 drone snaps to the remote controller. The joysticks of the remote are safely tucked in between the drone and remote. The result is a secure package with most of the sensitive bits tucked inside. Unfurl the machine and you have a slightly over one and a half pound quadcopter that is around an 8-inch square. It takes off into the sky reaching a maximum ascend speed over 11 mph, then scoot horizontally at almost 34 mph. GPS and GLONASS combine for accurate positioning with RTH support. In our tests, RTH averaged landing nearly 3 feet from its initial take-off location. While flying around, the GDU O2 captures photo and video from the sky with a 1/3-inch 13MP camera sensor. It shoots 4K video at up to 30fps and can fire back a live stream 720p video up to 0.6 miles away. Usually buying a new drone means it’s time to buy a new microSD card as well. Not so with the O2, this drone comes with 16GB of internal storage. All this fun can be had on a 4,000mAh battery that provides about 20 minutes of flight time. In true fashion for GDU drones in our experience, the O2 is a powerful machine with great agility. In a race with the (faster) DJI Mavic Air, the O2 was much faster off the line, and maintained the lead for a good distance before the faster drone caught up. And this was in novice flying mode. For the beginner pilot, or those that are heavy on the sticks, the GDU O2 will feel twitchy. Twitchy is not great for smooth video capture, but it sure is fun for booting around the park. On the flip side, the O2 floats a lot. From a full forward flight, let go of the sticks and the machine will come to a hover, at full speed, give the machine at least 10 feet to come to a stop. In contrast, the DJI Mavic Air halts in about 5-6 feet. I have configured custom control sensitivity on my DJI Mavic Pro. I opted for longer, smoother sensitivity, enabling DJI’s Cinematic mode. If you know what that feels like, how the Mavic Pro feels in Cinematic mode, then you have a good idea what the GDU O2 feels like. Floating comes in another form as well, the hover. I want to be clear, the GPS and vision sensor combined hover of the GDU O2 is very reliable and will keep your drone safe when you are not on the sticks. I’d call it one of the better self-hovering machines on the market, but I want it known that it floats around near twice as much as any DJI drone I’ve tested. As long as you give the O2 a solid 6 feet of space on all sides, it will remain within that space safely. For what it’s worth, the horizontal positioning is quite good, it usually does not drift far side to side. The vertical hover is what gets me. Almost every time I leave the drone hovering to take some photos of it, it floats down. No problem, grab the sticks, bump the drone back up into desired position and take my shots before it drops back down again. There are many that fear Wi-Fi connectivity for their drones. I am one of those people. As such, I have never flown the GDU O2 very far away from myself. I have gone as much as 400 feet out, and I have had no issues with connectivity nor even glitches in the live stream video. Every time I fly the O2 I go further, push it harder, and it has not let me down. The O2 is equipped with a collection of self-piloting camera modes. I suspect we’re going to see similar functionality on most drones moving forward. This includes one-tap functions for Dronies, Follow-me modes and more. The GDU O2 offers Circle Mode, Rocket Mode, Dronie Mode, Follow Me and gesture recognition to initiate controls by the wave of a hand. In the camera, look for Slow Motion, Burst Mode and Timelaps. Wrapping up autonomy, don’t forget there is RTH. A 4K shooter on a 3-axis gimbal is the ideal specs for a drone camera. Of course, there is so much more to it than just those two things. Overall, I am pleased with the photo and video capabilities of the O2. We can’t but compare the GDU O2 to DJI’s Mavic Air once again. Keep in mind that they were both built for the exact same purpose – a ~$750 machine that lives in between the Spark and Mavic Pro. In this comparison, the 100Mbps video data rate of the DJI Mavic Air produces superior video to the GDU O2. We’re not talking night and day here, both shoot solid imagery, but if you are only concerned about overall camera output, the Mavic Air is the better machine. Still photos are more comparable between the drones. We found that the default tendency of the camera was to expose for the sky. To explain that better, most shots we take have the sky in focus with good white and color balance. This means that the ground below is very dark in our images. We understand the difficulty of outdoor photography without HDR capabilities, we do not fault the O2 at all here. We just want you to know that you may want to manually control your exposure point for your shots, instead of going full auto. Speaking of full auto, the GDU O2 shoots video at 1080p resolution by default. If you want to capture 4K video, you will need to go into the settings to turn it on. You still only have 16GB of storage space, so choose your resolution wisely. I have a few minor bits of grief with the GDU O2. One of these is completely pilot error, but competing drones protect me from the mistake. I must admit that I am not a fan of the internal storage solution on the GDU O2. It is certainly convenient in the field, but a pain for me when I get back home. I don’t mind using a cable to connect the drone to my computer to pull image files, but I very much dislike that I have to fully power on the drone to do it. This method requires me to setup the drone for flight, remove the gimbal protector and all, and run off of battery, just to transfer files. I can adjust my workflow to handle this method, but I don’t want to. I work with SD and microSD cards in almost every camera equipped piece of technology I own, I have a workflow, the GDU O2 does not fit into it very well. The last time I took to the sky with the GDU O2, I recorded some amazing footage. Too bad I lost it all. I made the mistake of forgetting to hit Stop on the recording with enough time for the video to save on the internal storage before I powered off the drone. The file did not save, I lost six minutes of un-repeatable footage. I admit this is pilot error, but I would love to see failsafes inside the drone, as exist on almost all other cameras today, to finish writing the files when powering down. Image stability is also of concern, I am sad to say. We spoke to GDU at CES in January about the O2, they informed us then that they were completely redesigning the camera gimbal over shaky camera concerns. With the entire product launch delayed by months in order to fix shaky camera, I was completely surprised to find a shaky camera on my O2. The shaking I am referring to is a side to side jiggle in video capture when the drone is in motion. It is possible you didn’t notice this when you watched the drone footage, but I know some of you did, and I certainly do. It is not all that bad, to be fair, just one of those things I can’t un-see. In the end, our complaints are not deal breakers. The GDU O2 is a fun drone to fly, it is responsive, reliable and shoots solid imagery from the sky. The self-piloting modes add ease of use and the internal storage means you’ll always get your shot. Portability is the name of the game. If you need a drone that can safely take a bump or two in your pack, something that is easily contained in simple storage solution, I can think of no better with this level of flight and camera capability. I feel like the GDU O2 is not the best bang for the buck on the market right now. Their delay was their worst enemy. Had the O2 shipped before the end of 2017, as was originally planned, it would have dominated this segment of the market. 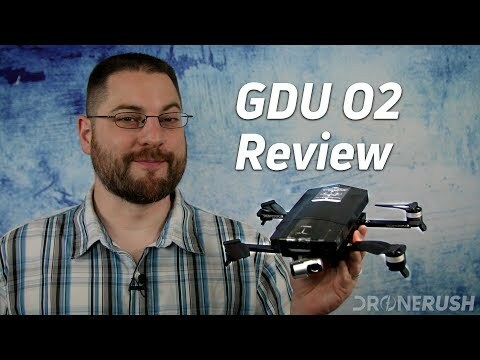 Plainly put, if the DJI Mavic Air did not exist, the GDU O2 would be the best compact drone you can buy for less than the cost of the Mavic Pro. We think the GDU O2 is a superb machine in its own right. It packs all the right features and flight capabilities the average consumer should need. It is fast and fun and well priced for non-professional drone pilots. You can grab the GDU O2 for $732 across retailers today. We are going to enjoy continuing to fly the GDU O2, and will be sure to share with you the fun we have. Stay tuned for more coverage of this compact drone, including some detailed comparisons to its nearest rivals on the market. Are you planning to fly the GDU O2?